A couple from Minnesota decided to go to Florida in January to escape from the cold winter weather and enjoy some fun in the sun. They planned to stay at the same hotel where they had spent their honeymoon 20 years earlier. However, because of their busy schedules and previous commitments, they were forced to fly down on separate days. The husband booked his flight for Thursday, and his wife was scheduled to join him on Friday. 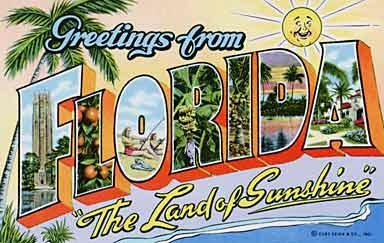 When he arrived in Florida on Thursday afternoon, the husband checked into the hotel. When he entered his room, he was pleased to see that there was a computer on the desk in the corner, so he decided to send a quick e-mail to his wife back home. Unfortunately, however, he accidentally left out one letter in her e-mail address. Meanwhile, somewhere in Houston, Texas, a widow had just returned home from her husband’s funeral. He was a minister who had died of a heart attack a few days earlier. The widow decided to check her e-mail, expecting to find some letters of condolence from concerned relatives and friends. She read the first message in her mailbox, screamed, and fainted. Her son rushed into the room, found his mom on the floor, and then looked at the computer screen. I know you’re surprised to hear from me. They have computers here now and you’re allowed to send e-mails to your loved ones. I’ve just arrived and have checked in. I see that everything has been prepared for your arrival tomorrow. Looking forward to seeing you! Hope your journey is as uneventful as mine was. P.S. It sure is hot down here! There are two morals to that little story. Number one, make sure you don’t leave out any letters in e-mail addresses; and number two, never forget that there is something at stake in this life! When that poor woman in Houston received that misdirected e-mail, her minister husband was hopefully in heaven with his Lord and Savior—or at least in purgatory. But the “other place” was a definite possibility for him—and his dear wife knew it! Which leads to the obvious question: What does it mean to ‘believe’? 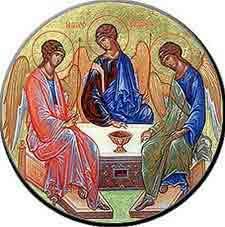 Does it simply involve saying Amen to a set of intellectual propositions, such as we have in the Nicene Creed? When our Lord tells us we must “believe,” he means two things: yes, we must assent with our minds to the Creed and the Catechism; but secondly—and just as importantly—we must obey with our lives! Belief, for Jesus, always implies obedience. This is crystal clear, incidentally, from a very interesting line that we read later on in John 3. In verse 36 of that chapter it says, “Whoever believes in the Son has eternal life, but whoever disobeys the Son will not see life, but the wrath of God remains upon him.” Notice that instead of saying, “whoever disbelieves in the Son,” the text says, “whoever disobeys the Son.” Disobedience, not disbelief, is presented as the opposite of belief. Obviously for Jesus—and for John, the author of the 4th Gospel—belief and obedience were pretty much synonymous. And that’s the way they should be for us—and for everyone who claims to be a believer in Jesus Christ. May that be our common philosophy of life, as disciples of the Lord. If it is, then even if they do allow e-mails out of hell someday in the far distant future, we can be confident that our relatives and friends won’t be receiving any of those e-mails from us. The Holy Spirit is known by many titles: the Paraclete, the Advocate, the Comforter, the Spirit of Truth, the Lord and Giver of life, etc. But here’s one title that you’ve probably never heard before: the Divine Disturber! The Holy Spirit—the Third Person of the Blessed Trinity whom we honor today on Pentecost Sunday—is the Divine Disturber. This thought came to me after I read something written many years ago by a man named Cardinal Joseph Ratzinger—who now just happens to be Pope Benedict XVI. It’s a meditation on Pentecost which he composed back in the late 1970s, when he was still a bishop in Germany. In other words, we wouldn’t expect Jesus, our conquering Savior, to send us a “Divine Disturber” after his incredible Easter victory—but that’s exactly what he’s done! And it’s the best thing he possibly could have done, even if we don’t always realize it or appreciate it! Because the Divine Disturber is the one who gives us new life in the sacraments, gets us on the road to heaven and keeps us there (if we let him!). And if perchance we get off the narrow road that leads to the kingdom, he’s the one who gets us back on it through the sacrament of Reconciliation (once again, if we let him!). But getting us on the road to heaven and keeping us there—or getting us back on the road after we’ve fallen into serious sin—may mean that the Holy Spirit will have to “disturb” us in some way. That is to say, he will have to exercise his role as the Divine Disturber! For example, have you ever heard a homily that really got you angry? Fuming mad? Well, there are at least two possible reasons for that. Either the preacher did not listen to the Holy Spirit and preached his own version of the Gospel (which can and does happen), or the preacher got it right and the Holy Spirit was convicting you of sin and challenging you to change your life for the better. In most cases, it’s either one or the other of those two possibilities. And just to let you know, it’s not only my preaching and teaching that does this to people. 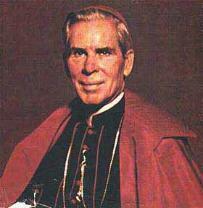 The great Bishop Sheen, for example, had this effect many years ago on a man named Louis Budenz. (This was back in the 1940s.) 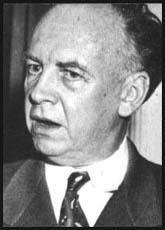 Budenz was the editor of the Communist Daily Worker, where he would frequently write articles in which he attacked Sheen. Sheen, of course, was a very strong and vocal opponent of communism. So he did. He talked to him about Jesus Christ and salvation—and Budenz hated every minute of it! Not long afterward, both he and his wife abandoned their atheistic communism and became Catholics. They were two of Bishop Sheen’s most famous converts. The Holy Spirit disturbed Louis Budenz and his wife out of their sin and into the Church—and he kept them there until death. That’s the power of the Third Person of the Blessed Trinity. In one way or another, we all experience this “disturbing” presence of the Spirit in our lives. And if you don’t believe me, just ask our new pope, Benedict XVI. As Cardinal Joseph Ratzinger, he actually prophesied his own experience of the Divine Disturber in the meditation I read to you a few minutes ago. Did you pick up on that? As far back as 1991, when he was working for Pope John Paul II as head of the Congregation for the Doctrine of the Faith, Cardinal Joseph Ratzinger wanted to retire. He wanted to go back to Germany to live a quiet life in his final years. He wanted to spend his time studying and writing books on theology, since he loved to do both. But the Divine Disturber wouldn’t let him! The Holy Spirit didn’t allow him to “settle down in comfort” (to use his own words). The Spirit had other work for him to do (as we all know) in “the service of truth”. So the next time you find yourself in a situation where you’re challenged to come out of yourself and serve someone else in need, know that it might just be the Holy Spirit working in your life as he’s worked in Pope Benedict XVI’s life. I’m sure that today—on this Pentecost Sunday—Pope Benedict XVI is praising the Holy Spirit for “disturbing” him in these later years of his life: for keeping him, in other words, from retirement and complacency, and for leading him to the Chair of St. Peter. Let’s join our pope by saying “Thank you” to the Spirit ourselves, for the times he’s convicted us of our sins, and challenged us to reform our lives and serve others. Because the bottom line is this: The Holy Spirit comes to disturb us in a good way here on earth, so that we will not be disturbed in a bad way for all eternity. 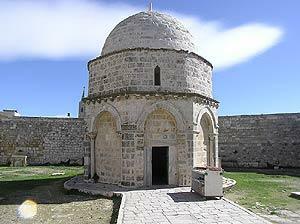 The Chapel of the Ascension, located on the Mount of Olives in Jerusalem. A close friend moves away—a trusted co-worker takes a job at another company—your mother or father or child or some other relative dies after a long illness. How do you deal with the loss? What do you do to cope? Those are very important questions, since we all face losses like these throughout our lives. Let me share with you today a few lessons on how to deal with such situations, courtesy of the 12 Apostles. 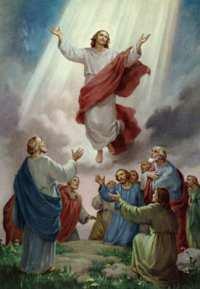 Lest we forget, they experienced a terrible loss in their lives on the first Ascension Thursday—the loss of Jesus! After living with these men for 3 years, and then appearing to them for 40 days after his resurrection, our Lord ascended into heaven, never to be with them in exactly the same way again. But, to their credit, the Apostles handled this loss much better than they had handled the loss of Jesus on Good Friday. Back then, they ran away and did everything wrong; this time, they did almost everything right. First of all, Scripture says, they prayed. They dealt with their loss through prayer. And this wasn’t just casual, half-hearted prayer that they engaged in. Scripture says, “They devoted themselves to constant prayer.” To be perfectly frank, they probably prayed as hard as they had ever prayed in their lives! And they engaged in this prayer together. That’s also significant. Scripture says that after Jesus ascended, the Apostles went to the Upper Room as a group. Back on Holy Thursday, they had scattered after Jesus was arrested; now they gathered together and prayerfully supported one another. Whenever we suffer a loss in our lives, we should also turn to prayer, believing that God’s grace can help us deal with our pain. And we also need to reach out to good friends—especially Christian, Catholic, believing friends—who will give us the human and spiritual support we need. Of course, if we want an even greater measure of help we should look beyond the friends we have on this earth and look to the “friends” we have in heaven—especially our Blessed Mother. This is something we also learn from the Apostles: the Bible tells us explicitly that Mary was with them in the Upper Room after the Ascension and until Pentecost. Notice, if you would, our last stained glass window. Pictured in that glass is the moment the Holy Spirit descended—10 days after the Ascension—and Mary is in the center of the group. You could say that there, in that window, you have 12 men dealing with their loss with the help of Mary. A couple of weeks ago in my Sunday homily I mentioned that young Karol Wojtyla—who would someday become Pope John Paul II—lost his entire family (his mother, his father, his sister and his brother) before he was 21 years of age. In the midst of those losses, he developed a very strong devotion to our Blessed Mother—so much so that when he became pope he took as his motto, “Totus Tuus” (meaning “I’m totally yours, Mary—I’m totally consecrated to Jesus through you”). Like Peter and the Apostles, Karol Wojtyla dealt with his losses by seeking support from the Blessed Mother. That, in and of itself, is a good reason for all of us to do the same. The Apostles, I think it’s safe to say, also turned to the Eucharist during this difficult time. After Pentecost, the Bible says that the early Christians devoted themselves to “the breaking of bread” (the “breaking of bread,” of course, was the Eucharist). Well, if that was the case after Pentecost, I think it’s pretty reasonable to infer that the Apostles also celebrated this sacrament before Pentecost when they were with Mary and the others in the Upper Room. I know many people who began to go to Mass daily at some point in the past after someone close to them died—and they’ve continued the practice to the present day. They continue to do it because they have found strength and comfort in the Blessed Sacrament, as the Apostles most probably did after the Ascension. And finally, these 12 followers of Jesus persevered. They prayed, they supported each other, they looked to Mary, they most likely received the Eucharist—and they kept it up for 10 days until the promise of Jesus was finally fulfilled and the Holy Spirit descended on them. Jesus had told them it would happen “within a few days.” They probably interpreted that to mean “1 or 2,” but they didn’t give up even after a week had passed. The bottom line, my brothers and sisters, is this: the Apostles could not stop Jesus from ascending into heaven; they could not prevent that “loss.” Most of the time, we can’t control the losses in our lives: neighbors move, friends change jobs, loved ones die—and we are powerless to stop any of it from happening. But what we can control is our response to the losses we experience, as these Apostles controlled their response to the loss of Jesus. May God help us to respond as they did—and to persevere—so that we will eventually experience the strength and consolation of the Holy Spirit that they all experienced at Pentecost. Always Be Ready To Give An Explanation To Anyone Who Asks You A Reason For Your Hope. They say that there are two certainties in life: death and taxes. Well, for the contemporary Catholic, one more item needs to be added to that list. In addition to death and taxes, a Catholic in the modern world will certainly—at least once in his life—hear the Church criticized in his presence. And sadly, some of us will hear the Church criticized in our presence every day—or almost every day. In certain instances, unfortunately, we won’t be able to do anything about it. We will be powerless to address the attacks and objections. But at other times, God will give us the opportunity to speak up and defend what we supposedly believe in. And what does the Lord expect of us in those situations? Please notice, he does not say, “Sometimes” or “Most of the time”—he says, “Always!” St. Peter tells us ALWAYS to be ready to explain what we believe and why we believe it! Those who attack the Church, incidentally, are counting on you NOT to be! They’re counting on your ignorance and laziness. Because when you don’t know—or don’t care to know—your faith, they prosper! And they typically lead many astray in the process. This group, by the way, includes those who attack the Church FROM WITHIN! You see, not all the enemies of the Church are outside her walls. Judas may have killed himself in the year 33, but, unfortunately, the spirit of Judas still lives! It lives within those priests and theologians and nuns and Catholic public figures of our day who openly attack the Church and her teachings in the public square. Some of them (I’m sure you’ve noticed!) have been very vocal in recent weeks. In fact, they’ve been literally all over the airwaves giving their “expert commentary” on the death of John Paul II and the election of Benedict XVI: Richard McBrien, Charles Curran, Joan Chittister, and many of their dissenting friends. Last week a man from Ashaway wrote against the papacy and the Catholic Church in our local newspaper, The Westerly Sun. Immediately, I sat down and put together a response, addressing the man’s errors. This person was clearly not a Catholic. That was obvious from the way he wrote. Consequently, his ignorance of the faith is somewhat understandable and excusable. I expect more from people like McBrien and Curran and Chittister, because they do know the truth! But sadly, these “experts in theology” do little more than undermine the faith of good Catholics by supporting almost everything the Church condemns. “Keeping your conscience clear” means seeking personal holiness. Peter wants us not only to speak the truth, but to live it as well. And that makes sense: if we don’t live what we profess, we won’t be able to convince anybody that our faith is true. And he says that we should act in this way so that when we are maligned, those who defame our good Christian conduct will be put to shame. Notice he says “WHEN” we are maligned, not “IF” we are maligned. Peter had been serving Christ long enough by the time he wrote this letter to know that some people would not accept the truth even if it was taught to them in a loving way by genuine saints! This, I think, should give us some insight as to the insane, hateful—and ultimately diabolical—accusations that have been leveled against our new pope, Benedict XVI, since he was elected on April 19. You talk about being maligned! You’ve heard the accusations, I’m sure: He was “God’s Rottweiler” when he served under Pope John Paul II; he stifled “free thought” among theologians; he was a member of “Hitler Youth”; he’s a polarizing figure; he hates women and homosexuals; he will move the Church backward, not forward—and on and on it goes. 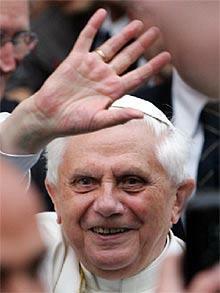 Let me tell you a few things about our new Holy Father, the former Joseph Cardinal Ratzinger. You can share these with the maligners you run into in future days. And he was smart! Before he became a bishop in 1977, Joseph Ratzinger was one of the greatest theologians on the planet; he was one of the theologians who helped to prepare the documents of the Second Vatican Council (so I think it’s safe to say that he won’t be changing any of the teachings of Vatican II—as some have said he will!). On a personal note, when I was a student at PC, and in grad school in Toronto, and in the seminary, Joseph Ratzinger was one of the theologians whose writings I studied. And he was well worth reading! Since 1981, he’s been the head of the Congregation for the Doctrine of the Faith, the office of the Curia that’s responsible for making sure the Catholic faith is taught as it should be. And he’s done a fantastic job as head of that office—despite what McBrien and his friends say. They don’t like our new pope because when Ratzinger was a cardinal he saw through the lies they tried to pass off as genuine Catholic teaching, and he did his best not to let them get away with it! In the past, when he was asked to identify the reasons for all the confusion in the Church since Vatican II, Cardinal Ratzinger would often speak of “relativism.” He would say that the relativism of the world—especially the western, industrialized world—has infected many Catholic universities, seminaries, etc., and has led some people to mistakenly believe that every dogma and doctrine can be changed, and that there are no absolutes—especially in the area of personal morality. It’s like asking a scientist to change the law of gravity! He can’t do it. You may not like the law of gravity (especially when you fall down! ), but a scientist is powerless to change the law! It is what it is. Our new pope knows by experience (like John Paul II knew by experience) how relativism eventually leads to destruction—personal and social destruction. He witnessed the phenomenon, firsthand, growing up in Nazi Germany! “In his formative years, [Joseph] Ratzinger heard Nazi propaganda shouting that there is no truth, no justice, there is only the will of the people (enunciated by its leader). As its necessary precondition, Nazism depended on the debunking of objective truth and objective morality. Truth had to be derided as irrelevant, and naked will had to be exalted. Relativism was the philosophy that stood behind Nazism—and Communism. And this is the philosophy that liberal theologians like McBrien and Curran now want us to embrace in the Church! 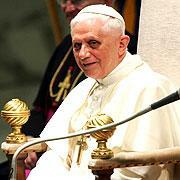 Benedict XVI—like John Paul II—says what Jesus says. And that’s why I dearly love this new pope!